Smooth seas or choppy waters? 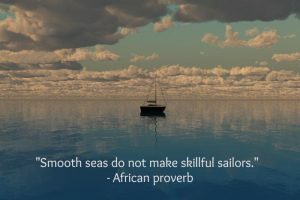 Leading others is not particularly difficult when all is well…when those committed to the successful completion of major projects and key initiatives experience the wind at their backs, when everyone is pulling together and the seas are calm. It’s the major set backs, the windless days, the heavy seas and the unexpected storms that challenge us, sometimes to our core. How can you see “choppy waters” as an opportunity to practice your art of leadership…of bringing out the best in yourself and others? Want to learn to be great at this? Check out the Leadership Laboratory coming up soon!